After teaching for many years, the Kansai artist Mika Seike returned to her career as an independent animator in 2014 when she began the Geidai (Tokyo University of the Arts) graduate programme. Her early works always impressed with the innovative ways she used scanned textures and visual metaphors to create her poetic animated shorts. A Black Cat (黒い猫 / Kuroi Neko, 2015) is Seike’s first year work for the programme, and as such is shorter than her other works. The film is minimalism in nature with a limited colour palette and a dark background. 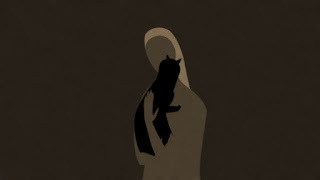 A faceless woman holds a black cat in her arms. The focus of the film is on the subtlety and sensuality of the act of caressing a cat. Like a typical cat, the black cat is not content to stay still but resists with occasional sudden movements. Eventually the cat slips from the woman’s arms and she touches her hand to her face. It occurred to me while watching this film that it like the animated version of a still life painting – instead of capturing the inanimate, commonplace object, Seike captures an animate, commonplace incident of everyday life – cuddling with a house pet. Mika SEIKE ( 清家美佳, b. 1974) is from Kansai. She started making independent animation films in 2001. After working for many years in the field of education, Seike rejuvenated her animation career at Geidai in 2014. She graduated from the programme in 2016. Learn more about her through my reviews of Thinking and Drawing: Japanese Art Animation of the New Millennium and Face to Face (お向さん2007). You can follow her on twitter to learn more.